on Denny Street at seven in the morning? are passing to their final destination. no tension in the limbs or in the heart. it's in those sentences, themselves imperiled. Lift up your voices, cries the aging hymn. and no less formless than a jotted dream. 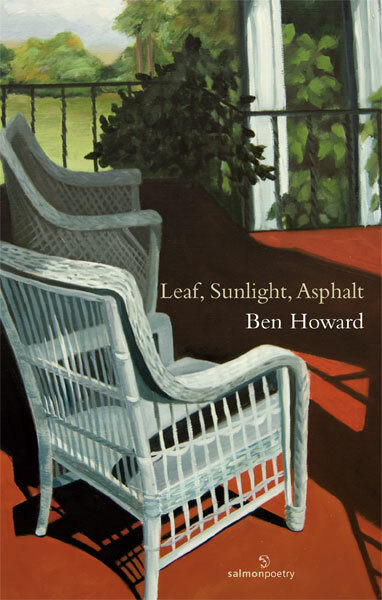 For Ben Howard, Leaf, Sunlight, Asphalt extends this poet's own Eastern perspective, sharpened by his own Irish exchanges. A critic of its literature and a practitioner of Zen, Howard places himself at the same crossroads that Carr meets. For Howard, however, Dublin represents not home as it does for Carr with his garden, but a reminder of a past literary glory and a present but elusive revelation. "The Glad Creators" opens part one. He wishes he'd been born a decade earlier, "an able novice setting out,/ Equipped with confidence and cautious diction/ But all the same a lamb among those lions/ Who frequented McDaid's and Davy Byrne's,/ Reciting Yeats or Ferriter by heart/ Or bellowing invectives to the rafters/ Or sitting meekly with a ball of malt" (13). He conjures up Behan and O'Faolain, Kavanagh and Flann O'Brien, and Parsons Bookshop with "May O'Flaherty/ Who made a temple of a common shop" (16). Howard takes on his forebears but betrays no anxiety for their influence. He sizes up each lion, and returns each glance steadily. "Dublin in July" contrasts South Great George's Street, "this street that's no more Irish than its name" filled with panini, tandoori, noodles, and "The cell phone bleating from a stylish belt" (20). Here, he asks: "What has become of that revered, imagined/ Dublin of O'Brien and O'Faolain,/ Its taste as Irish as a ball of malt?" It may be found in Liverpool or Boston or a pint of Guinness, Howard muses, but not among the traffic press of Vespas. Evanescence flows through these linked poems as through Carr's; both know their return to a place they sought will weaken their memories from what they have read, once revealed as real. Howard fondles his latest poetry volume in 2004, in a place with "bamboo screens suggestive of repose" (22). Yet, its name warns of a lesson learned by Carr. "The Samsara Bar and Café" stands in Buddhist teaching for "the never-ending/ cycle of birth and death, the end result/ of ignorance, aversion, and desire". He contemplates his new book of verse, one more poet with one more added to a long line of Dubliners native and not. He recognizes a truer moral that tempers his morale, sitting in the café with "its sparse calligraphy replete with meanings/ well beyond my ken". From such moments of comprehension and mystery, Howard creates his contemplation. His verse moves firmly, as confidently as the "cautious diction" favoured by McDaid's lions. Yet, as with Carr, Howard hesitates. He retreats from hubris. "Leaving Tralee' finds: "As for the page/ I'm writing over tea too hot to swallow/ I see it as a sieve, through which the pungent/ odor of last night's fish" from the clattering kitchen reminds him of the passing patrons in his hotel's lobby, "and all the sights I have or have not noticed/ are passing to their final destination" (27). His yellowing journals remind him of an "aging hymn" and seem "no less formless than a jotted dream". Part two surveys his Midwestern childhood. "Original Face" takes on the Zen koan: "What was your original face/ before your parents were born?" (31). He concludes, after gazing at a photo of his mother and father on a canoe earlier in their courtship about "the son who can't be seen/ but nonetheless abides/ somewhere in those waters,/ those high Midwestern clouds" (32). He anticipates, in hindsight, "all the hoarded thought of forty years together" that his parents shared. For now, Howard recalls his own dimming childhood memories. For Carr, these filled with death: ManU and his mother. For Howard, they remain more innocent tastes and smells and sounds. Part three invites Thomas Merton's "lucid silence" to continue such a return to purity. Howard lives near where Merton summered as a poet-critic himself before he entered the Trappists; Howard finds Merton's hard-won wisdom elusive today. Like that English professor turned monk, Howard lingers within nature for solace. "One Time, One Meeting" (also the name of Howard's spare meditations collected as his blog) summons in Zen fashion the entry of the ethereal into the ordinary. It begins: "Picking up the phone to call my son,/ I entertain the thought that every act,/ No matter how familiar or banal,/ Might be construed as unrepeatable/ And all of life as ceremonial" (49). Precisely, Howard as has Carr moves forward on his determined path, to blaze into the everyday a trace of the otherworldly, which in its own universality permeates life. Life passing, mortality for both poets waits. "What I May Rely On" reads in full: "Turning into nothing, all those days/ Remain in memory as though their patterns/ Persisted when their dyes had long since faded./ Here is the morning sun. And here is dusk/ Consuming every tree on the horizon". It continues: "Turning into forms of which I know/ Only a little now, my own two hands/ Tell me that the bones beneath that skin/ Are what I may rely on to continue,/ Whatever may come of mark or wrinkle" (58). Howard finds in his body's reduction to not skin but bones his own sign, a Jolly Roger of sorts to mark his sailing over another ocean towards a port he cannot imagine. Carr came full circle back to his Dublin garden to find renewal as the seeds planted on his departure grew into flowers. Howard circles too, within the persistent patterns of nothingness that endure far longer than any plant's dye, lost in the diurnal glow of savage sun and altering night. The collection finishes with "Right Livelihood", on the occasion of his retirement from teaching. The speaker fumbles as he struggles to find for his professorial peers the proper tone. He refers to Philip Larkin, who called in his university appointment his supervisor "Toad", but then opts for a more diplomatic, and Zen-like, address. He chooses 'Frog', but "not the frog that brought/ enlightenment to Basho" (66). He chooses a croaking hungry creature as his avatar. Seeking to ease aspersions rather than to cast them at his colleagues, he calms himself. Borrowing "a leaf/ from Basho's heritage", he calls his collegial faculty by invoking the Buddhist injunction to Right Livelihood and Right Speech in hopes of truth. He seeks in his verse as in his valedictory speech a signifier "that indicates what's there/ and never what is not;/ that waters seeds of joy/ and equanimity", but one that in truth also calls out "greed and cruelty" when necessary. As with Carr who admires in the refusal to capitulate to defeat Basho's own example of fortitude under pressure, so does Howard evoke the same haiku master's heritage to guide him on a path less directly trod by the Japanese poet and his Irish follower, but one which whether in the streets of Dublin or the corridors of a college in upstate New York keeps to the same fidelity. John L. Murphy coordinates the Humanities program at DeVry University in Long Beach, California. His current research includes the invention of the concept of "Celtic Buddhism".